A year or two after Revenge of the Sith came out, I more or less stopped collecting Star Wars action figures… I had more than I could possibly display at one time, and how excited can you get about buying different versions of the same character over and over again? 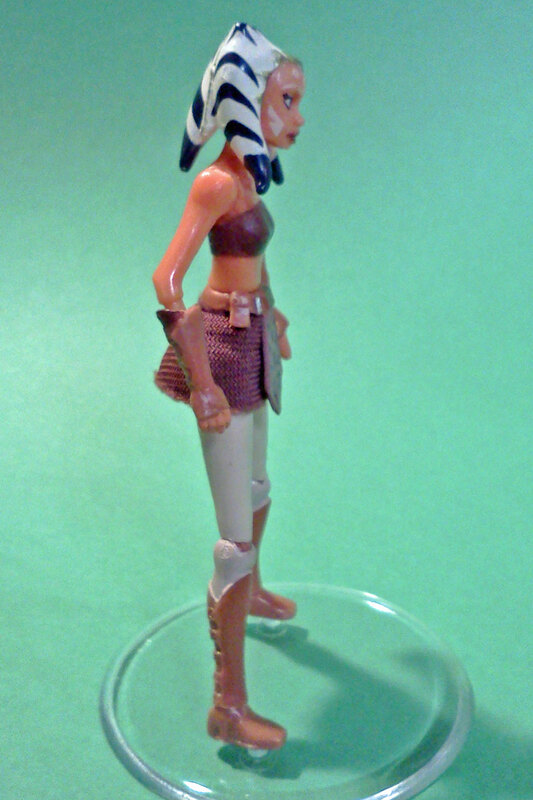 So I managed to miss the first Ahsoka Tano figure that was released shortly after the Clone Wars series debuted in 2008. Fortunately, she’s not that expensive or difficult to find seven years later. I was able to purchase a loose version with the money I got for selling off my extra Black Series Yoda. 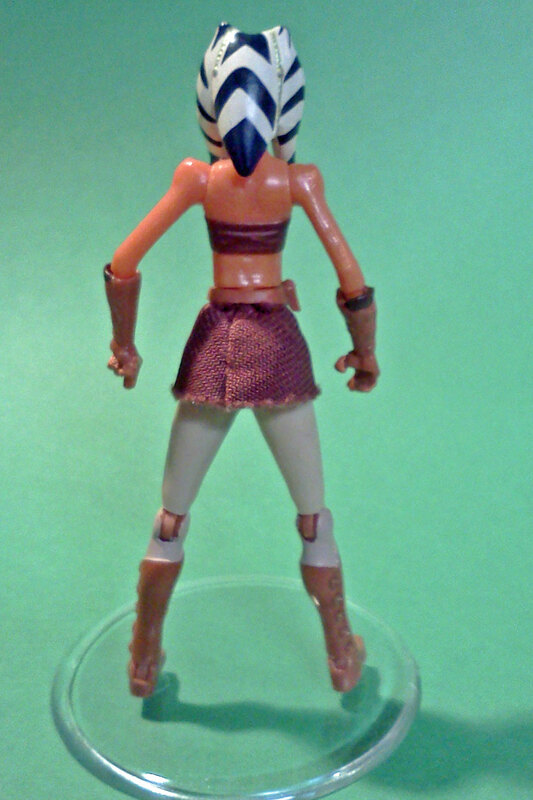 As you’d expect, Ahsoka is a tiny little thing. I can’t imaging too many survived being played with like toys with both arms intact. Despite her size and fragility, Hasbro packed in as much articulation as they could – Ahsoka has a ball joint at the neck, shoulder joints that allow a full range of motion, rotating movement at the elbows and waist, and leg articulation that includes knee and ankle joints. While additional elbow articulation would be nice, it wouldn’t have been realistic – Ahsoka’s forearms aren’t much thicker than her lightsaber blade. 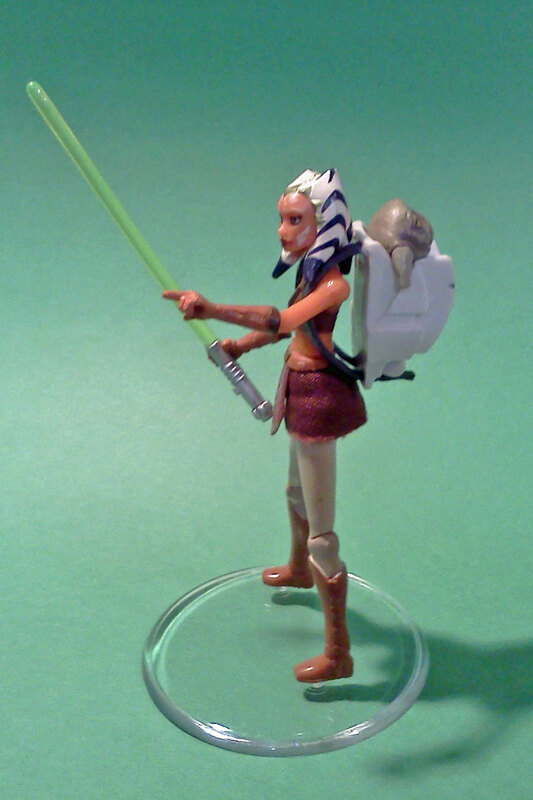 While it’s not really an issue if you display Ahsoka with her backpack accessory, her shoulders do seem a little bit too large for the rest of her body when you remove it. Paint ops were pretty good on my figure, but there is some sloppiness at the top of her boots and on the edges of her gold head ornament. Rotta the Huttlett, who could have easily been a throwaway accessory, has sharply painted eyes and enough skin detailing to make him seem like a real second (tiny) figure. 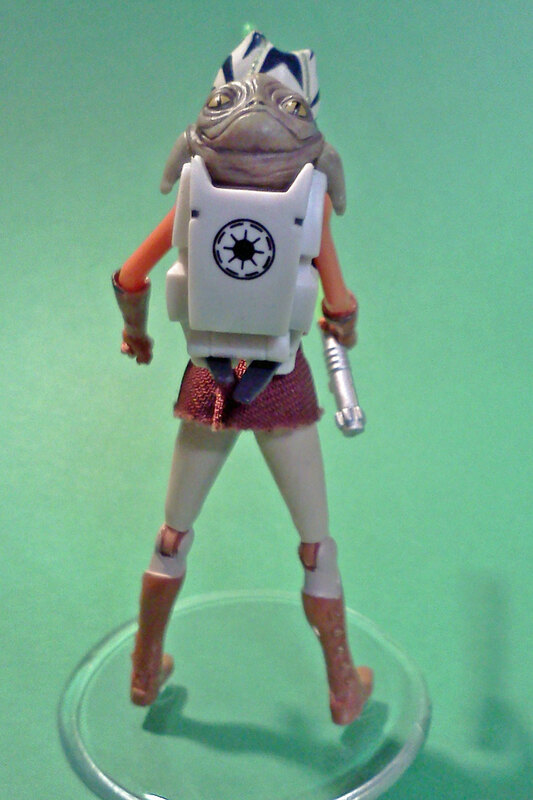 Ahsoka’s backpack works well to carry Rotta and has no problem staying on. It looks like it could work with some other action figures, but I haven’t tried to see how it looks on anyone else. 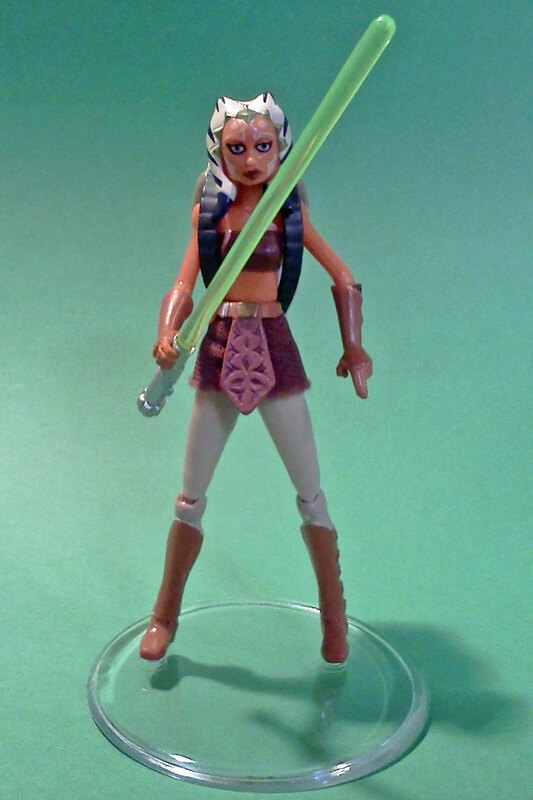 I think I got the wrong lightsaber with my Ahsoka figure, but that’s the peril of buying loose toys. The hilt is a bit large for her hand, but she can hold it and it does have the correct green blade. 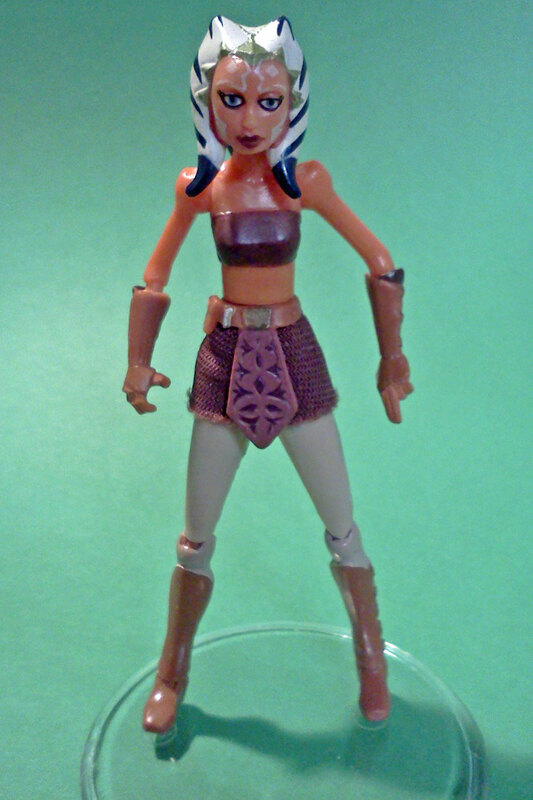 I’m happy I finally have an Ahsoka figure in my collection in the outfit I remember her wearing in Star Wars: Clone Wars. Previous Post RetroBlasting Star Wars TIE Fighter Restoration Extravaganza!